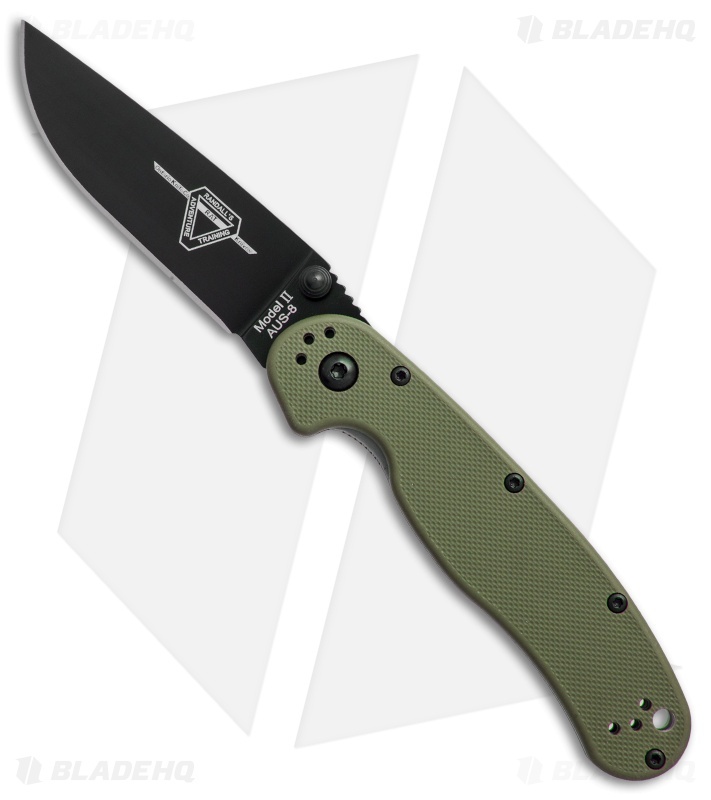 This RAT Model II has a textured OD green nylon handle and a black finished AUS-8 stainless steel blade with a plain cutting edge. If you like the Ontario RAT Model 1, but want something a little less bulky, then you'll love the Model 2. The RAT Model II is based on the popular Model I, it's smaller, but retains the same great shape and performance of the original. This knife is designed for comfort and performance with an index finger groove on the handle to keep your hand where it should be and jimping on the spine of the blade for controlled cutting. The handle features textured nylon 6 scales with an open-built steel liner lock frame. The RAT Model 2 is fully ambidextrous with dual thumb studs and a 4-way reversible pocket clip. 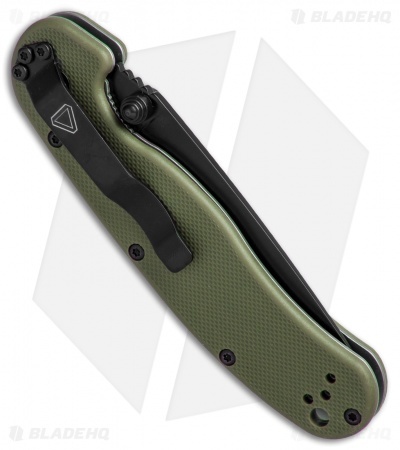 I am super bummed as i ordered the aus-8 version of this knife right before hearing they came out with d2 in the same colorway. 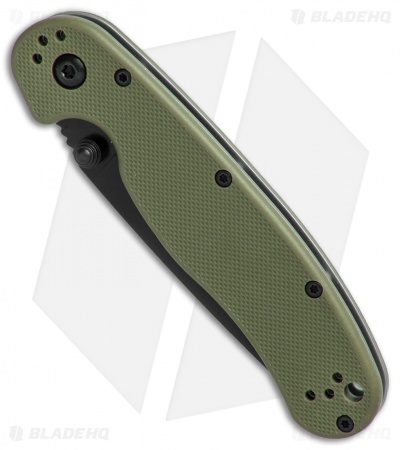 That aside, this knife has a great action and opens with authority. A little small for my hands but perfect for someone with small-medium sized hands. 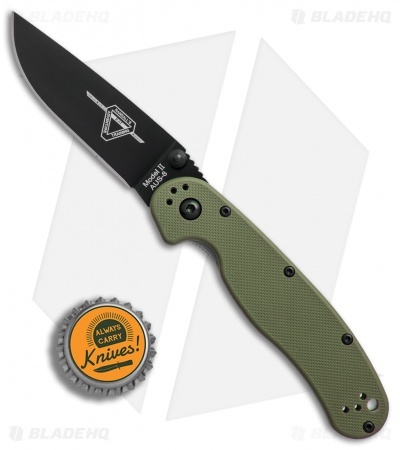 Overall, I would really recommend it or if your into frame locks go chech out the izula by esee. 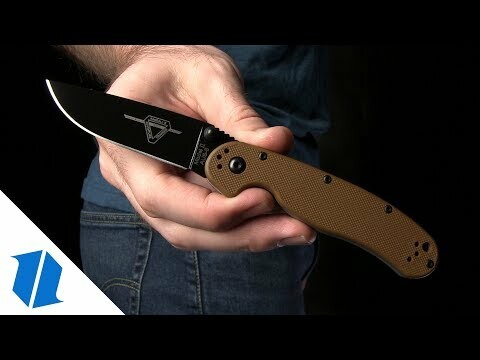 Can't say enough great things about this knife, smooth action, perfectly sized, neither the thumb studs or the pocket clip tear up your pants. You need at least one of these, if your on the fence about this knife, don't be, worth every penny, will be buying more.